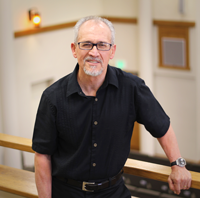 Xavier Ries is the Pastor of Calvary Chapel of Pasadena in California and has been for over thirty years, which began from a home Bible study of three people in the city of Alhambra, five miles south of Pasadena. The church grew and developed in the city of Alhambra for about six and a half years as a tent ministry, renting facilities and going from place to place. Then the Lord opened the door to buy the building in the city of Pasadena, which was an unexpected redirection, yet very directed by the hand of God then and recognized more so now through the years. In the last thirty-plus years, God has developed and matured the body at Pasadena to reach out to the city, as well as the surrounding communities with the gospel, to missions in Mexico, Central and South America, Spain and other places. Radio has also been used to reach the lost and to educate the saint, throughout the years, both in the U.S. and Latin America. Pastor Xavier was born-again in July of 1973 at the age of twenty-three and married the same year and has been blessed to see God work in many different ways for the last thirty-five years by the grace of God. The focus of ministry has been and still is, the exposition of the word of God, in order to set people free from being followers of man, by being able to examine the Scriptures for themselves like the Bereans, through good inductive Bible study.